Looking To Have Your Fireplace Repaired Or Remodeled? Call On Jiminy Chimney’s Experienced Professionals! The fireplace is often one of the most treasured features of the home – but unfortunately, it can also be one of the most neglected. Unattractive smoke stains go years without being removed, cracks are ignored, and we learn to accept the outdated style and look of the mantel and surround. But here at Jiminy Chimney, we think the fireplace should enhance the space it’s in and bring you joy when you gather around its warmth. Outdated, damaged fireplaces are not only unsightly, but they can also be inefficient and unsafe to use. 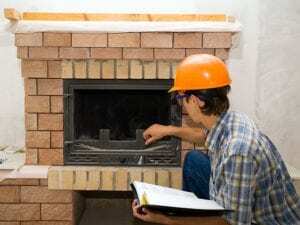 Is it time you had your fireplace repaired or remodeled? Let Jiminy Chimney assist you with all of your fireplace needs! We specialize in fireplace repairs and can take care of everything – from necessary repairs to a stylish remodel. Most commonly, fireplaces show their age in the form of cracked mortar and crumbling brick. The mortar joints between brick may begin to recede or develop holes, cracks, and gaps, and the brick itself may look worn and weathered. Whether the facing of your brick has begun to deteriorate, you’ve started seeing more and more cracks in the masonry, or your mortar joints are stained, weathered, and deteriorating, we can help. Our Chimney Safety Institute of America (CSIA)-certified chimney and fireplace professionals are expert masons. We specialize in tuckpointing (which is the process of grinding out old mortar joints and packing new, fresh mortar in its place), brick replacement, and smoke stain removal, and can restore your fireplace to its original glory. Experiencing issues with your fireplace? At the first sign of trouble, contact Jiminy Chimney! There are many problems that can plague the fireplace, but we can swiftly diagnose the issue and offer a comprehensive solution that will get your unit running efficiently again. If your fireplace is feeling dated and worn and simply doesn’t fit with or enhance the space it’s in, consider a fireplace remodel service. At Jiminy Chimney, we specialize in updating old fireplaces of all types and ages. We can help refresh your space by adding a beautiful new mantel or replacing dated brickwork with modern natural stone. Our team will listen to your wants and needs and work to give you the fireplace you envision for your space. Ready to have a team of professionals come in and give your fireplace the TLC or makeover it desperately needs? Call Jiminy Chimney at 847-893-0063 or request an appointment online today. We’ll take great care of you and your home and guarantee mess-free service! Repairing or rebuilding the firebox is just one of the fireplace and chimney repair services we provide. Ask us for details today.